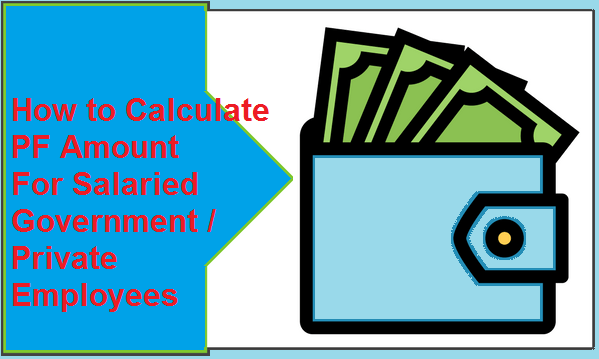 Calculating Procedure on Provident Fund PF Amount for Salaried Government / Private Employers…. Employees Provident Fund (EPF) is a government run initiative that is under the Employee’s Provident Fund and Miscellaneous Provisions Act 1952. This scheme mainly covers establishments in which 20 or more people are employed. Each employee’s whether in the public or private sector and earns a basic salary of Rs.15,000/- has to register themselves with EPF. An employee will then be required to part with 12% of the basic wages together with a Deafness allowance as PF amount / PF contribution. When an organization has less than 20 employees then the employee’s and employer contribution drops to 10%. The entire contribution of an employer is not added to the EPF kitty. This is because 8.33% of their contribution is sent to Employees Pension Scheme but is calculated on Rs.15,000/-. The remaining balance is then retained in the EPF scheme. What makes EPF a good investment is the fact that you can access your full contribution upon retiring. For this reason, you will have to keep track of the entire contributions by calculating the PF contributions and interest. 8.33% into Employee Pension Scheme (EPS). 0.01% is directed towards EDLIs administrative charges. When the employee’s income is below or equal to Rs.15, 000, then the PF amount of salaried Employers is calculated as follows. When the monthly basic salary is above Rs.15, 000, then you can use any of the methods below to calculate PF amount for a salaried employer. 12% of basic pay plus Dearness allowance for the Employer PF contribution together with 12% of basic pay i.e. 8.33% of 15,000 as the Employer PF contribution. 12% of basic pay plus Dearness allowance as employee contribution and 3.67% of Rs.15, 000 as employer contribution. 12% of Rs. 15,000 as employee contribution combines with 3.67% of Rs.15, 000 as employee PF contribution. After computing the employee and employer contribution you will have to determine the interests accrued. Interest is computed on the opening balance of each month. For the first month, the opening balance is usually zero and thus interest accrued is zero. The second month interest is calculated on the first month’s closing balance. This balance is reached at by adding the employee and employer’s contribution for the 1st month. The total employee and employer contribution at the end of each year is then added to the interest accrued during 12 months. This action is repeated until the retirement age when you can withdraw 90% of the EPF corpus.